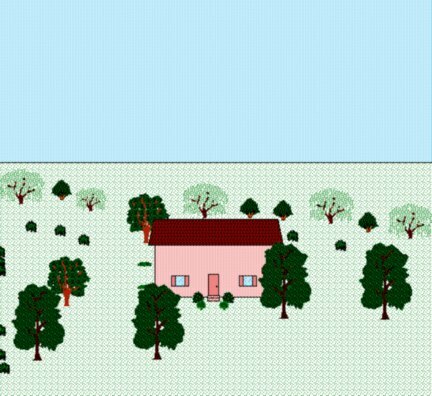 Use the hundreds of landscape objects in the 2D Home, Office, and Landscape Library, such as trees and shrubs, to do landscape planning. 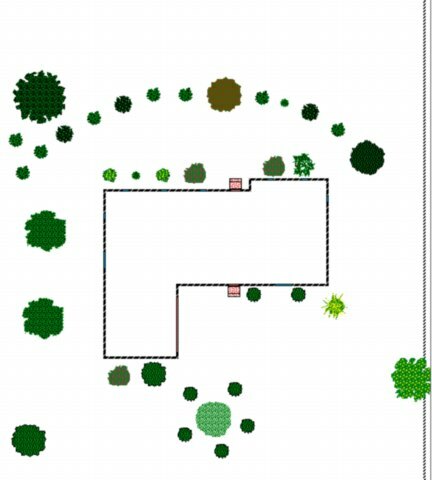 Simply draw a couple of rectangles to represent your house’s and garage’s top views, and then use our tree and shrub libraries to represent those plants you have or those you plan. Note that in order to depict growth over time, it’s good to use the Contract function on the Edit menu to downsize younger trees and shrubs. 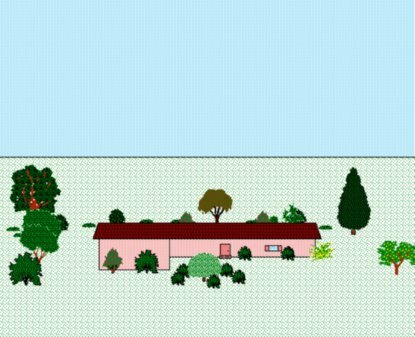 You might like to try to depict how tree growth changes the look of the property every 5 years for 40 years. The trees, as they come from the library, are approximately the size of mature trees of that variety (i.e., a Pear Tree object will represent its correct mature size just the way it is in the library, without any size changing). 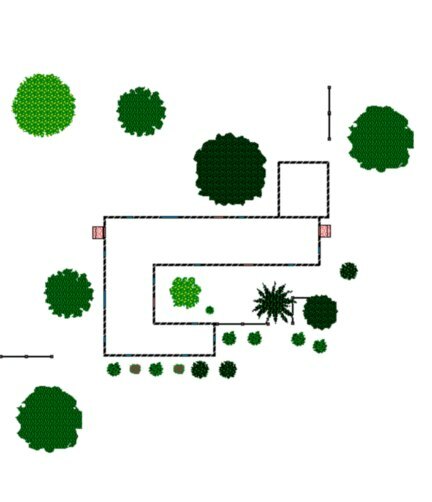 To create a side view (“elevation”) of your landscape plan, draw a couple of rectangles to represent your house’s and garage’s side views, and then use the side views of the trees and shrubs in our tree and shrub libraries to landscape this side view. Note that each type of plant is supplied in pairs–with top and side views together in the libraries so it’s easy to see what object to use when you “elevate” a top view into a side view. Feel free to add detail to your house structures, in either top or side view, to make them more realistic. I.e., windows, door, shingle patterns, siding patterns, paint, chimneys, railings, fences, swimming pools, driveways, sidewalks, garages, etc. The 3 major folders in the 2D Home, Office, and Landscape Library are Samples, Templates, and Objects—this latter has 42 object libraries in it. Any library that begins with the words landscape, tree, trees, shrubs, fences, or garden will be useful when landscape designing with MacDraft. Above is a Contemporary house and lot top view which we made into an elevation. 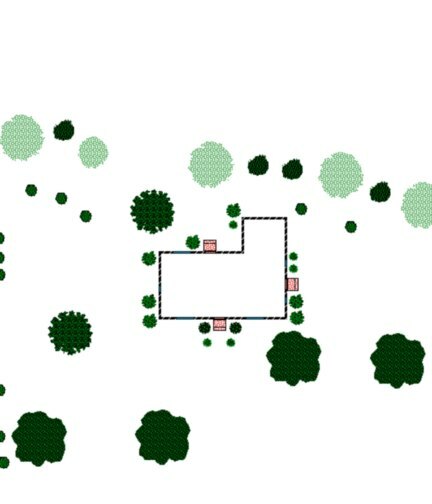 We accomplished this by making a printout of the top view for reference and then, when creating the elevation, placing the behind-the-house trees first, then drawing in a house which is mostly a few rectangles with fill patterns in them, then finishing up by adding in-front-of-the-house trees. 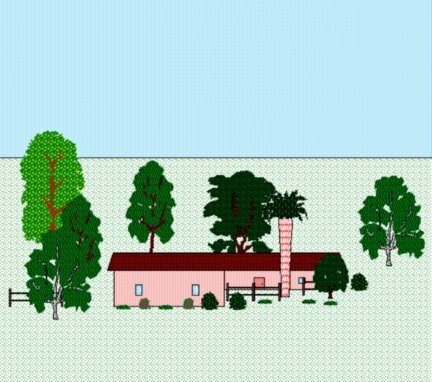 One has to create elevations from back to front so the rear objects get partially or wholly obstructed from view by the house and other trees, and the front-most objects are fully visible, all of which is as it should be. Note that one can create elevations from any of four perspectives—corresponding to the north, east, south, and west views. Above is a Colonial house and lot top view which we made into an elevation. For simplicity, the details about sidewalks, driveways, and garages were left out, but this isn’t because the dwellers are all Green fanatics who ride nothing but bicycles. In truth, the plans will not be totally ready until these essential items are included. Above is a Spanish house and lot top view which we made into an elevation. All the tall, mature trees give a nice look to this elevation. Just imagine the difference it would make if we shrunk all the trees down to the size of freshly planted trees using the Contract function on the Edit menu. Also, we depicted uncompleted fencing which stands out as work left unfinished in the plan. Perhaps confronting this plan will motivate the property owner to complete this work.